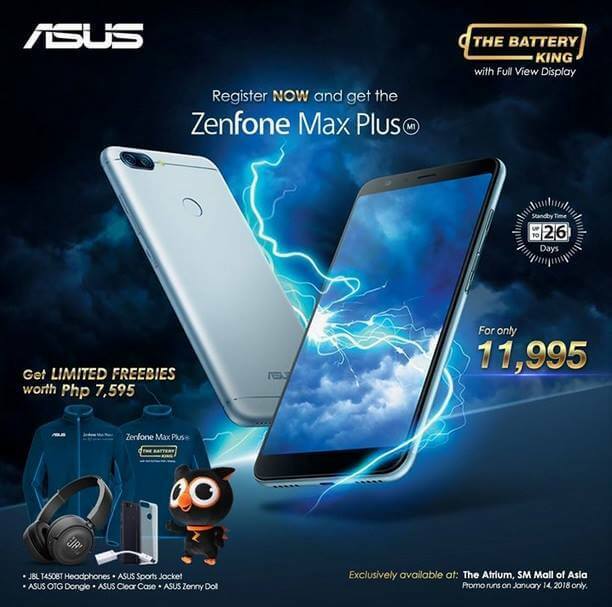 A few days ago, we reported that the Asus' Battery King, the Asus Zenfone Max Plus M1, is arriving in the Philippines this coming January 14. Today, the Taiwanese smartphone brand unveiled its official price, and it is quite affordable considering its specs, not to mention that it comes with loads of freebies too. The Asus Zenfone Max Plus M1 has a suggested retail price of Php11,995. But, that is not all, the 150 buyers that will pre-register at bit.ly/ZenFoneMaxPlusRegisterNow, and 50 walk-in consumers will also get freebies worth Php7,595 during the Zenfone Max Plus launch event in SM Mall of Asia Atrium on Sunday, January 14, 2018. The free items include a JBL T450BT Headphones, an Asus Sports Jacket, OTG dongle, Clear Case and Asus Zenny Doll. To give a quick recap, the Max Plus sports a 5.7-inch IPS display with 18:9 aspect ratio and FHD+ resolution. On the inside, it is powered by 1.5GHz octa core processor paired with 4GB of RAM and 32GB of internal storage. It also boasts a dual camera set-up on its back, and an 8MP secondary shooter for taking selfies. Moreover, it is equipped with a huge 4130mAh battery.